VHD Founder/Director - Jane Merrill, business owner and resident of San Juan Bautista. Her initial career covered 26 years in Corporate Marketing Management with 3 Silicon Valley giants including Hewlett Packard. 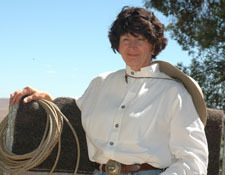 Jane changed paths 20 years ago, applying her skills and experience toward her passion "traditional western heritage". Utilizing her business planning skills, design management, event production (NY World Trade Center, Hawaii, Las Vegas, San Francisco, Monterey) along with her interest in western fine art, Jane created Southwest Roundup Studio Gallery in addition to a Marketing Management & Consulting business handling selected artists and non-profit organizations who seek expertise related to traditional western art and events. She has served on Chamber Boards of Directors in 2 counties; affiliated with Agriculture History projects; Visiting Nurse programs and Museums lending expertise in organizational/marketing aspects. Jane is retained by selected artists for marketing and business guidance, and offers design expertise for collateral pieces, web sites and print projects. She is a contributing writer for magazine and promotional publications; was founder/editor of Vaquero Heritage Times Journal a seasonal publication about California's early beginnings & vaquero heritage, and she continues to operate Southwest Roundup Studio Gallery showcasing handcrafted western art, lighting, furnishings and gear - all with an early California flair. The original Vaquero Heritage Days 2010 event benefitted Old Mission San Juan Bautista's Preservation Fund. The 2012 Vaquero Heritage Days event was held at St. Francis Retreat on Historic Rancho San Justo, a significant property from the Mission "Rancho" Era where vaqueros actually lived and worked during the 1800s tending herds of livestock including sheep, cattle and horses. Proceeds benefited the Franciscan Friar's Retreat Center. The 2014 & 2016 Vaquero Heritage Days held at the St. Francis Retreat welcomed visitors from 15 states & Canada, all eager to share knowledge & celebrate California's vaquero heritage! Proceeds benefitted the Retreat Center. And...The 2018 Vaquero Heritage Days will be hosted by Friars at the St. Francis Retreat Center. The proceeds from event help sustain the Retreat Center's significant 73 acre facilities. The event is educational, informative and raises public awareness of San Juan Bautista, the Retreat Center and California's unique vaquero heritage. "The lore & legacy of the California vaquero - a Living Legend"!